After exactly two months out of my classroom, I spent two marathon days in my room at the beginning of the week. It was a little odd to be back after so long away, but I have quickly found my way back into “school mode.” The past two days have been full of sifting through all of the papers that I held onto during the year, organizing materials, and shifting furniture. I will post some pictures of my new classroom layout at some point next week. I am already being much more intentional about making sure that my classroom arrangement and design lines up more smoothly with my personal theory of learning — I’ve put almost nothing on the walls to ensure that the students have plenty of room to display their creations and I’m situating their seating arrangements far differently than I did last year. I am hoping that it will be a learning environment that will grow with us during the year, rather than confining us and our thinking. We had a school staff meeting on Monday, so I was also able to get all of the scheduling information that I needed to plan my schedule for the year. 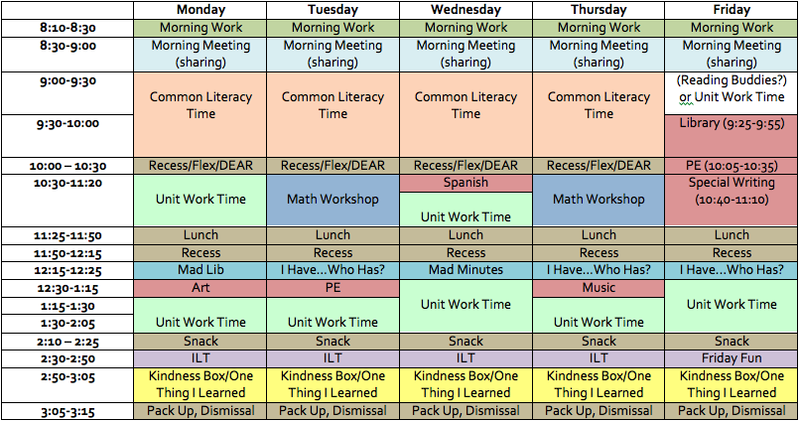 I’m going to be trying out a few new things in terms of shaping the learning time, including an “Independent Learning Time” in the afternoons, where students will be able to work on any project of their choosing or continue to work on other things that they may have started earlier. I’m also going to be making sure that I do one Spanish lesson a week with my students — my school doesn’t offer foreign language, so I’ve been studying up so that I can teach them myself! My weekly schedule breakdown looks like this (at the moment, anyway). We actually have a pretty long school day, but I’m already feeling really worried that I won’t have nearly enough time to fit everything in — my units tend to be long, interdisciplinary, and quite involved… We’ll see how it goes! I start my official staff requirements at school next week. As a final summer hurrah, I am heading on a trip to Canada this weekend. I haven’t been since I was really young (and have no recollections whatsoever about the trip), so it will be exploring somewhere new for the first time, which I love. I’m going to be visiting Quebec City and Montreal. It should be a great way to wrap up the summer! I’ve always loved Rethinking Schools, so I figured that one of their two publications on my reading list would be a good place to start my education reading this year. After devouring Open Minds to Equality this week, I think that I may have already found the most useful book that I will read from my list. If you are remotely interested in social justice education in the elementary grades, I advise you to go buy this book right away. I cannot believe that it has been sitting on my bookshelf for two years and I’d never so much as opened it. If there was one book that I regret not reading before I started my first year teaching, this is it. I became passionate about and did a lot of research and reading around social justice education while I was in college and in graduate school. The trouble with many of the excellent publications around social justice education (some of which I will also be reading this year) is that they are often very theoretical or focus on implementing these ideas at a secondary or college level. Open Minds to Equality opens with two quick chapters summarizing why social justice education is worthy of pursuit and then follows with 9 chapters full of brilliant activities for having elementary students explore many different dimensions of discrimination. The chapters build upon one another in complexity and I could imagine my second graders being able to complete many of the lessons with some minor modifications. 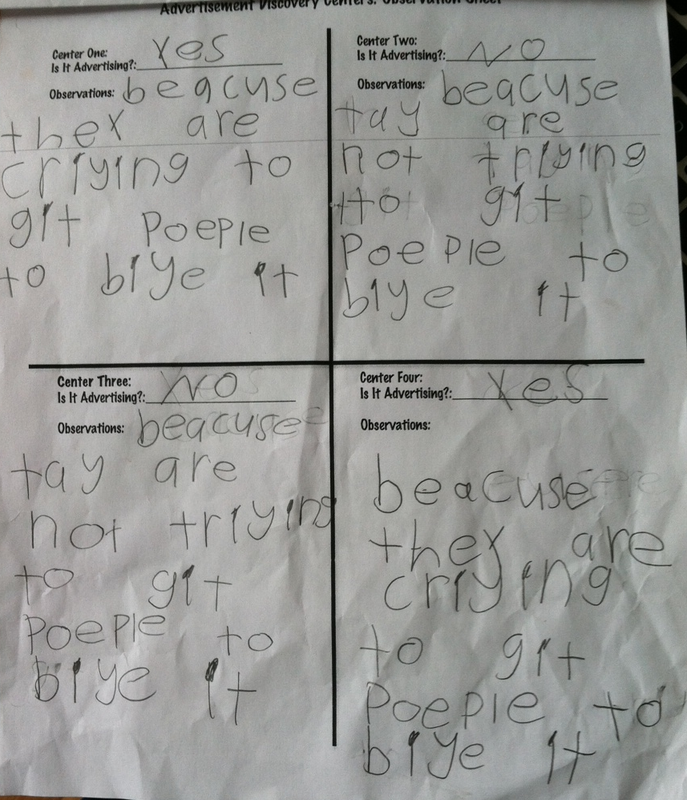 (The ideal grade range for these lessons is probably 4-6). I’ve already begun a list of activities from this book that I hope to incorporate this year, but I think that the foundational activities for building trust and classroom community will really set the tone for my classroom next year. (Again, that sense of regret that I didn’t read this book sooner!) Many of the lessons would map well onto any curriculum already in place in an elementary classroom — I know that I found many lessons that will help to amplify the critical lenses that my students bring to my advertising unit and there are several activities about calendars that I plan to use during my holidays unit next year. I also appreciated that many of these ideas could be applied to any content that a teacher might have to cover. Another excellent feature is the extensive resource section in this book. I have been quite frustrated with my efforts to find non-biased books for my classroom and have worked hard to piece together many of the brief lists that seem to be out there for specific topics. Open Minds to Equality has a lengthy bibliography of fiction, nonfiction, and media resources for supplementing these lessons but which I will also use to continue to build a diverse classroom library. I feel as though all this praise makes it sound like I’m trying to sell the book to you all — I only wish that I had some affiliation with Rethinking Schools. In the midst of a rough January in my classroom, this book has left me feeling inspired not only about the things that I will put into place next year, but about the lessons that I can use right now to rejuvenate my students and to deepen the sense of trust and community in my classroom. I think that I’ll end this review here. Next up on my book list — the classic Real Boys by William Pollack, which will likely only inspire me to use the countering-sexism lessons I found and flagged in Open Minds to Equality! One of my biggest goals for my classroom has been to involve my students in as much of what goes on in our classroom as possible. As I’ve been getting my bearings this year, it has become obvious how much easier it is to not let students have a lot of voice in determining what goes on in our classroom. It’s much simpler if I just decide what we’re going to do and what it’s going to look like — and some days, it’s a real struggle to keep seeking their input. Anyway, two weeks ago, I took the biggest — and riskiest — step yet in incorporating student choice in our classroom. After looking over the curriculum topics, I am confident we’ll have covered most of them by May, so I turned over control for deciding what we’ll study in May entirely to my students. I explained this to my students and reveled in the looks on their faces as their notions of teacher as curriculum-chooser shattered in an instant. 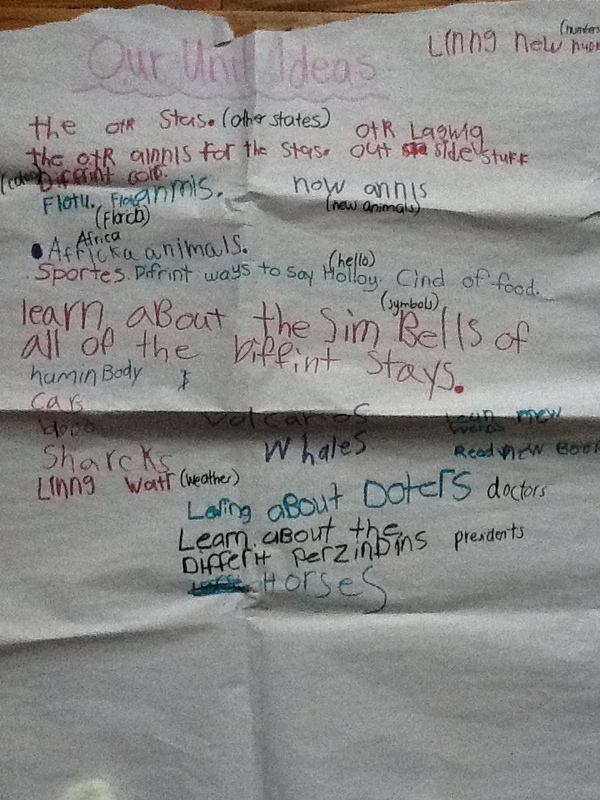 I wrote on a piece of chart paper “Our Unit Ideas” and then left the paper easily accessible on our easel for two weeks. The next steps in this process are for me to discuss some of the details of the unit with my second graders. I want to find out what kind of project or product they might want to create at the end of the unit and what information they want to learn about volcanoes. 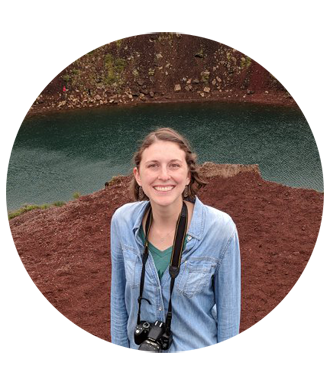 Working with the students on this has been so invigorating — and I am hopeful that it will lead to greatly increased student motivation when the volcanoes unit does roll around. I really cannot wait! 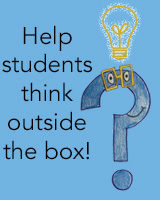 What do you do to incorporate student choice in your classrooms? I’d love to hear any ideas floating around out there! I Haven’t Been “Scared” Away! I am not sure who is more excited about Halloween — me or my students! Unfortunately, planning for Halloween (and a Red Sox World Series) has eaten up so much of my time that I have to postpone a quality blog entry until the weekend. I have devised a day-long logic puzzle for Thursday that will begin when the students find a bowl of candy that was supposed to be for our party has mysteriously vanished. I will also disclose something here that is top-secret information in my classroom — I am dressing up as Jane Goodall for Halloween! Hopefully, my students will remember who she is from our gender and science lesson. So, be on the lookout this weekend for a post about my Halloween festivities and about my second country “field trip” to Mexico. Here An Ad, There an Ad, Everywhere an Ad! This month, I’m delving into a brand new unit on a topic about which I am extremely passionate — advertising. During my Master’s year, I took a wonderful course called “Growing Up in a Media World,” which motivated me to try to make sure that I help bring 21st century literacy skills into my classroom. My goal this month is to help my students develop some media literacy skills as they learn to become both aware of and critical consumers of many different types of advertisements. I opened my unit by doing a KWL chart with my second graders — unsurprisingly, they did not know very much about it. Together, we created a working definition: “Advertisements try to make you want to buy something, go somewhere, or do something.” Then, using this definition, I had my students circulate around to four different stations in the classroom — one had catalogs, one had books and magazines, one had brochures, and one had various fliers. My students had the chance to peruse the items at the station and then consider whether they thought that it represented advertising or not. The students came up with great reasons to defend their opinions and in our debriefing discussion, we were able to address many misconceptions (i.e. all advertisements have to list prices). A completed advertising center sheet. On Wednesday, my students took the “Is It Advertising?” challenge. I prepared a PowerPoint slideshow with various clips and pictures that were either content or advertising. My students really caught on — they were easily able to tell the difference between the trailer for “The Lion King” and a clip from the movie. I was also impressed when they noticed the product placement I was planning on having to point out to them in a photo of the American Idol judges with their always-present Coca-Cola cups. For homework this past week, my students have been working on creating a log of all of the advertisements that they encounter at home and while they are out and about with their parents. I am eager to see what they discover! This coming week, unit activities will include designing an advertisement for a common classroom product (which will require several meetings with an “ad executive” to approve and push on their plans) and an exploration of the messages about gender that are conveyed through advertising. I am so excited to see what they create and what they make of the messages about gender on Barbie.com and GIJoe.com! My second graders’ scientist gallery. Once everyone had a chance to contribute our scientist gallery, I asked my students to take a few minutes to think about what was similar and what was different about the drawings that they had produced. My students commented that they all looked slightly different, but that most of them were in a lab working with “potions” and that they were doing science inside. 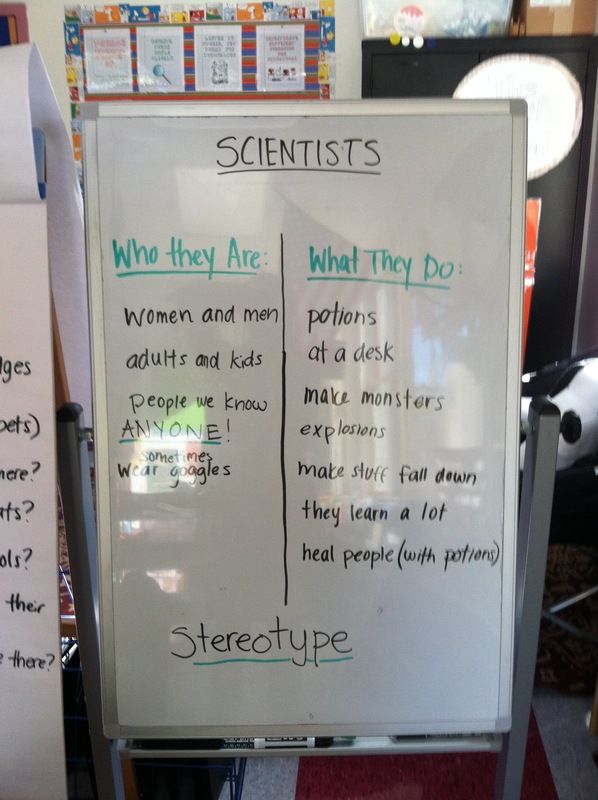 Once students discussed their observations, I had them brainstorm and contribute to a T-chart about who scientists are and what they do. This lesson provided a segway into one of my favorite biographies Me…Jane by Patrick McDonnell. This particular text highlights several of the key themes of my biography unit — all famous people were once children not unlike my students and that childhood dreams and habits can shape who we become. As I mentioned earlier, my first thematic unit of study has been about biographies. The emphasis in this unit has been on students feeling inspired by remarkable individuals; realizing that they, too, can become someone important; and getting to know one another. I’ve also woven in math and history topics related to schedules, telling time, and dates in history. 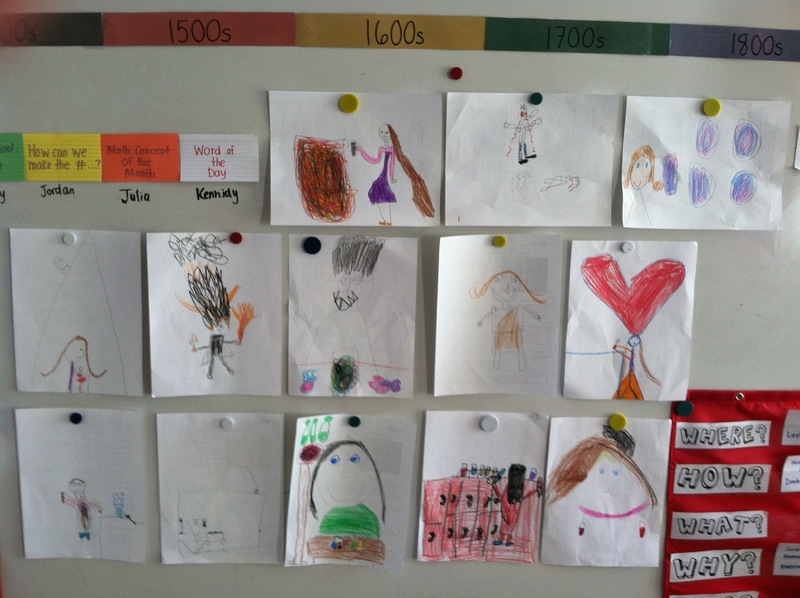 We began our unit with a KWL chart – my second graders came up with some great questions about biographies. I used the questions that the students brainstormed to shape the discussions that we had during subsequent read-alouds and guided reading sessions. We have had some quality discussions about the types of illustrations included in biographies and the methods biographers use to conduct research about their subjects. 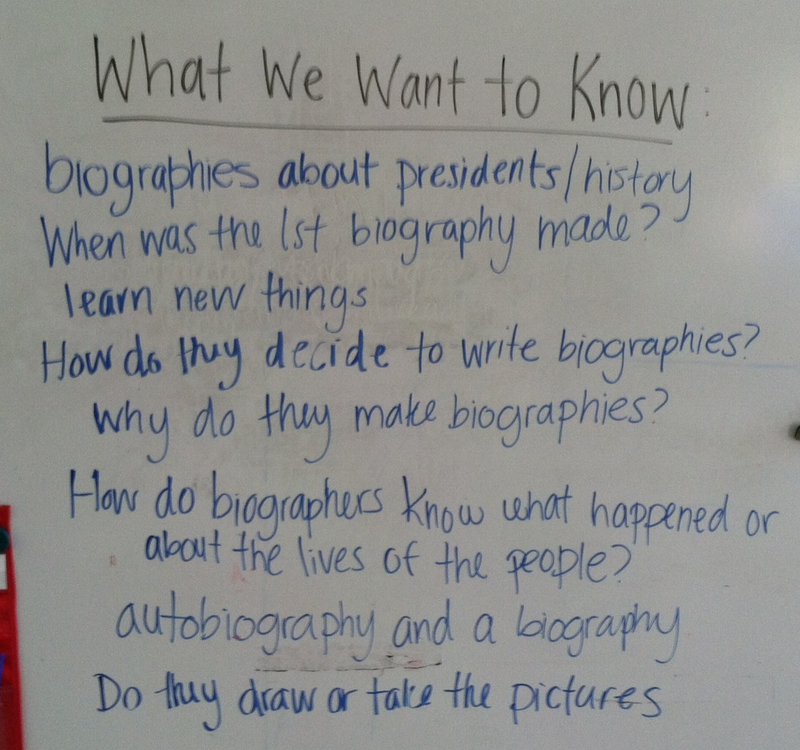 I’ve been really pleased with how interested the students are in biographies and autobiographies — it’s been a really accessible jumping-off point for introducing students to some of the key features of nonfiction texts. My students have made extensive use of timelines (including adding key dates to our classroom timeline from their own lives), glossaries, and author’s notes. We’re wrapping up our unit this week with the students completing and sharing their own autobiographies, revisiting and answering some of our initial questions about autobiographies, and thinking about things they might do to bring their own passions and goals to fruition. This unit has been a great way to get our year rolling because it’s given me ample opportunity to expose students to some of the issues that we will be exploring throughout the year, including race, heritage/ethnicity, gender, and social justice and diversity more broadly. It’s also given me a chance to start pushing them to think beyond their small rural community — and its largely homogenous population — to the broader world in which they will one day be (and already are) citizens.